Orlando located in the central portion of the Sunshine State is one of the most popular destinations for family travel around the country. Orlando Florida attractions are majorly dominated by tree mega sized entertainment complexes, including Disney World Parks, Universal Studios Resorts and SeaWorld bringing an annual visitor count of the city of Orlando to over 50 million guests. Around these “dinosaurs” of Orlando Florida attractions visitors will find a plethora of restaurants and hotels in Orlando Florida ensuring the ultimate satisfaction to all guests arriving to this beautiful city. Despite the popularity of the theme and amusement parks, you can also explore other no less interesting Central Florida attractions if you read our list below. 1. Walt Disney World Parks – The best of all Orlando Florida attractions drawing over 20 million visitors annually. This gigantic city contains four major theme parks, a dizzying array of rides, attractions, live entertainment and shows, a plethora of shopping and dining options. At Animal Kingdom children will be delighted to meet Africa’s and Asia’s most wonderful animals, watch theatrical performances and play. There are also two large water parks within the Disney World Parks complex including Blizzard Beach and Typhoon Lagoon. 2. 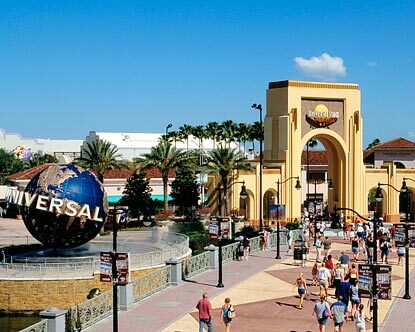 Universal Studios – The ultimate movie themed amusement park and one of the finest Orlando Florida attractions well known around the world, Universal Studios takes you behind the scenes and plunges you in the action packed fun of their popular movies. Only here you can experience 11 incredible themed Universal Studios Orlando rides engaging literally all of your senses and keeping you on the edge for the duration of the rides. Best of all you can participate in the interactive live shows to really understand how your favorite movies are staged and filmed. 3. Islands of Adventure – Explore seven distinctly different Universal Islands of Adventure centered on your family’s favorite movies. Whether you are into dinosaurs at the Jurassic Park, Spiderman or Hulk at Marvel Superhero Island, or the wizards at the Wizarding World of Harry Potter, you will not be disappointed. There are over 25 themed rides, entertainment for the whole family and live shows to keep you busy for days. 4. Sea World Orlando – A marine based wildlife park offering unparallel animal encounters, educational tours and live marine animals shows. In addition to its wildlife, SeaWorld offers great rides and rollercoasters of varying degree of intensity. Its nearby Discovery Cove which is also run by SeaWorld Resorts is a unique park offering amazing experiences in a resort like setting, including swimming with dolphins and exotic fish, aviary exploration and brand new SeaVenture adventure. During your SeaVenture experience you will walk through the Grand Reef underwater while wearing a specially designed dive helmet that does not require for you to have a scuba diving certificate. 5. Gatorland – One of the favorite Orlando Florida attractions allowing you to learn everything you ever wanted to know about alligators and crocodiles. At Gatorland guests love attending live shows, walking across a long boardwalk through an alligator cypress swamp and shopping at the crocodile themed store. 6. Downtown Orlando – It’s a busy tourist and business area bustling at any time of the day or night. During the day visitors can see fantastic exhibits at various local museums, picnic at famous Lake Eola Park, dine at hundreds of restaurants and shop till you drop. Farmers market is a great place to stock up on organic produce, fresh fish and meat, listen to live music or feast at outdoor restaurants serving artisan and organic foods. 7. Sammy Duvall Watersports Centre – Located at Disney’s Contemporary Resort Marina, this world class aquatics center offers visitors to engage in a variety of water sports like jet skiing, parasailing, wakeboarding and tubing. Even if you have never attempted these daring activities, professional aquatics trainers will have you up and going in no time. Rent a personal jet ski or set on guided tours along picturesque Bay Lake. 8. Lake Eola – Easily recognizable landmark centered in the heart of downtown Orlando drawing millions of visitors to its park, nearby shopping and dining destinations. One of the signature features of Lake Eola Park is without a doubt a beautiful fountain that can change colors at night presenting a lovely spectacle. 9. Orlando Museum of Art – OMA holds an impressive collection of American, South American and African art from different eras. In addition to a vast gathering of paintings, sculptures and objects, the museum offers educational courses for adults and camps for kids on various art techniques. For lucky guests who are visiting during the 1st Thursdays of the month, you will have an opportunity to attend an original OMA art party presented by local artists focusing on a certain art technique accompanied by live music shows and drinks. 10. Orlando Science Centre – Located in the heart of Loch Haven Park, this premiere educational museum will become a favorite landmark for many guests with children. Kids can get involved in a ton of fun and crazy hands on exhibits and displays, see physics and chemistry in action. Brush up on astronomy at the Dr Phillips CineDome giant screen, get your wiggles out at the Kids Town Play area and see gigantic dinosaur bones at the DinoDigs. 11. Holy Land Experience – A Biblical museum presents a refreshing break from the craze of amusement parks in Florida and invites guests to take a journey back to Christ times. Holy Land is a great recreation of old time Jerusalem showcasing important Biblical places and events like the Garden Tomb, the Great Temple and more. You will see theatrical shows, biblical talks and reenactments of crucial Biblical stories. 12. Wonder Works – Think of it as a fun science museum where your teenagers will learn about science through games and fun hands on exhibits. A perfect place to come on a rainy day to see powerful forces of electricity, water and light. 13. Wet’n Wild – One of the best water parks in Florida geared towards older children and teenage visitors. Whether you want to plunge right in high thrilling solo water rides or have a blast riding together with your friends, or perhaps take it easy on relaxing lazy river or wave pool, all of these needs and more will be met at Wet’n Wild. 14. Titanic Ship of the Dreams – Visitors weary of overabundance of theme parks can take a welcoming break by visiting this amazing “live” museum where you will be greeted by actors dressed in costumes to resemble 1912 era passengers of the fateful vessel. The exhibits throughout the museum portray various areas of the actual ship telling their unique stories through photographs, objects and memorabilia. 15. Mall at Millenia – Shoppers’ ultimate paradise featuring designer and mass merchandise retail stores lining up streets at Conroy Road near famous International Drive. Among its premier stores you will find Macy’s, Neiman Marcus, Gucci, Apple Store and many others. Mall’s design features contemporary lighting, glass elevators and even fountains.